In the Forex market, trends reflect the average rate of change in price over time. A trend is a useful indicator of where the market is headed and offers an opportunity to take action to achieve a specific target. Not surprisingly, traders consider trends to be their friend and Wall Street believes in never going against the trend. Trends alert us to the overall direction in which prices are moving. The prices can move up, down or stay flat. If there isn’t a current trend, prices will remain relatively the same; without changes in price, you may not be able to trade profitably. 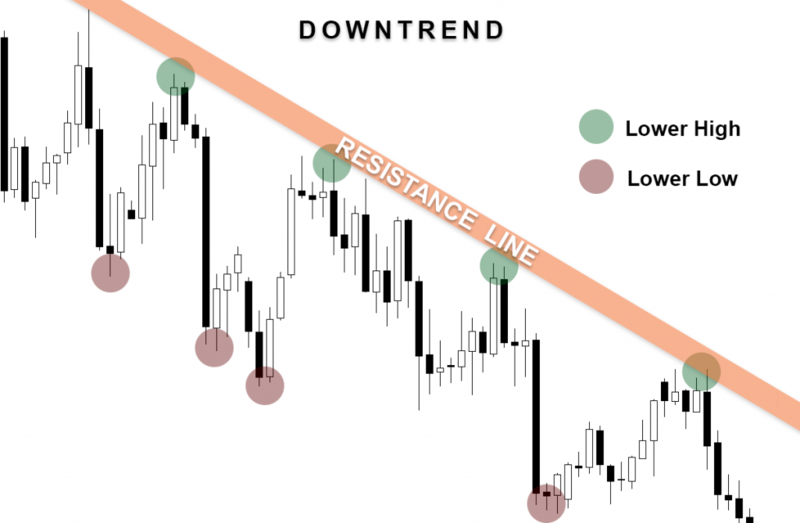 Currency trends can be categorized into three types based on their direction : uptrend, downtrend and sideways trend. Trends can also be divided according to their duration : long term, short term and intermediate. An uptrend signifies that the market is trending in the upward direction, creating a bullish market. A price rally is observed, with some periods of consolidation or movements against the prevailing trend. 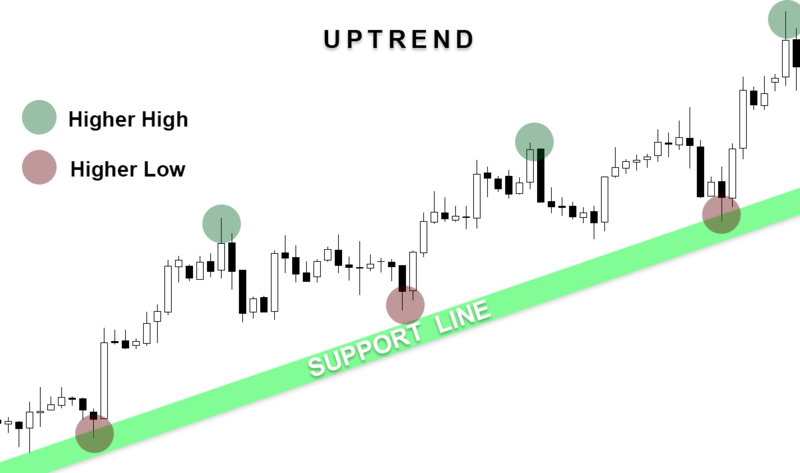 An uptrend is characterized by a positive rate of price change over time. The price movements on the price graph form a series of higher peaks and valleys. The trends continue on until there are some changes in the conditions or value. If the general trend of the market is headed upwards, you need to be cautious about taking any positions that rely on the trend moving in the opposite direction. A downtrend in the forex market is characterized by a price decline, with some periods of consolidation or movements against the prevailing trend. Contrary to an uptrend, a downtrend results in a negative rate of price change over time, and signals the continuation of a downward move. The price movements indicating a downtrend form a series of lower peaks and valleys in the price graph. 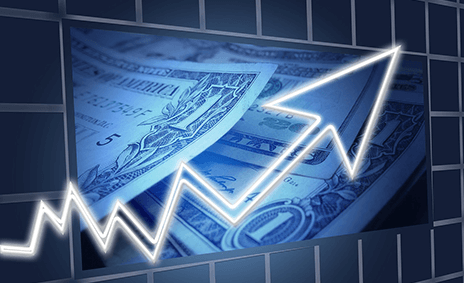 The Forex market is not affected as much by downturns as other financial markets. As selling is such a common phenomenon in this market, it is fairly immune to downward trends in price. You trade one currency against another, which means something is always going up even in times of financial or economic turmoil. 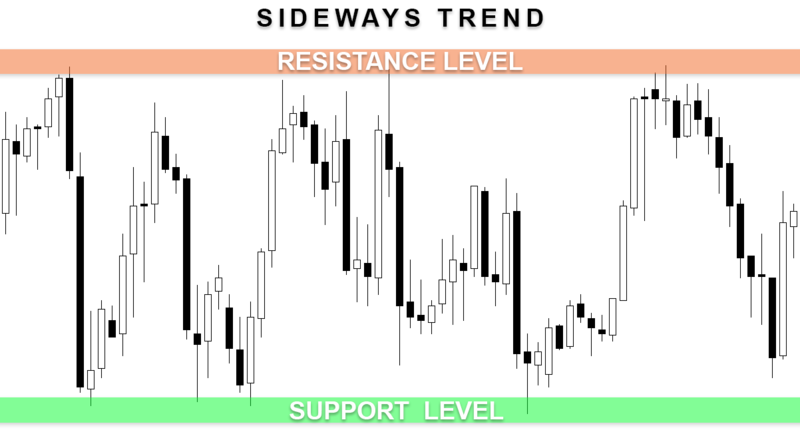 A sideways trend is a horizontal price movement between levels of support and resistance. It occurs when the market does not have a sense of direction and ends up consolidating most of the time. A sideways trend is seen as horizontal lines occurring between drops and falls in currency price. The trend can last anywhere from a couple of days to a few weeks, after which the price can rise or drop off. The direction in which a currency price moves after a sideways trend in the market is most often the original direction prevalent before the trend occurred. Currency prices can be said to behave more stably during a sideways trend. This offers an entry point for investors with targeted trading strategies. However, the common trader behavior during a sideways trend is to lay low until a new trend emerges. A long term or major trend lasts for more than a year. An intermediate or secondary trend can span anywhere from three weeks to a couple of months. A short or near term trend lasts less than three weeks. Sometimes, an intermediate trend can be a correction in a major trend. The intermediate trend could itself comprise of a series of troughs and peaks, each of which can be identified as near term trends. 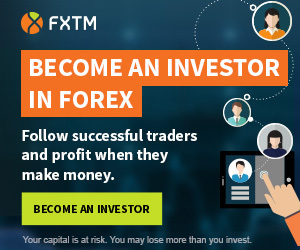 It is best to view long term forex trends on daily charts, intermediate trends on hourly charts and short term trends on 15-minute charts.